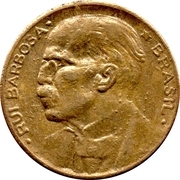 Portrait of Ruy Barbosa (1849-1923), facing right. Denomination above line. Date below, star above. Ruy Barbosa was born in Salvador, Bahia, on November 5 of 1849. Ruy Barbosa was a politician, diplomat, lawyer and jurist. He was endowed with vast erudition, and was an excellent speaker. He supported the republican movement and had a great participation in the Republic Proclamation process, which took place on 15 November 1889. 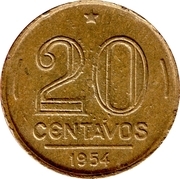 He also became the first finance minister in the history of Brazilian Republic. Although the coin brings RUI with an I, his name was with Y.